“The highest attainable density of the substance under given conditions.” Well duh, even I could have cobbled that together. Now, you may be asking yourself what any of this has to do with cooking. The simple answer is that my freezer has finally reached a state of Maximum Density. I don’t know how well all the science jargon explains the current situation in my Fridigaire but it does, in fact, currently resemble a solid state of matter. It is physically impossible to put another thing in there and steps must be taken. The Mistah and I have agreed that it is time to Eat Down the Fridge. I’ve seen lots of buzz on the web recently about this topic. The idea is that for a given period of time you refrain from grocery shopping and utilize the ingredients you currently have. Normally I would think that not buying any groceries in a week would be impossible. What about things like eggs, milk, and yogurt? And how can I make a PB&J if I have no bread? But given the current inventory of both the fridge and freezer, I think we might just be able to do it. We will have to change the way we plan meals for the time being. Instead of picking out recipes and then buying the ingredients, the Frigidaire will be the inspiration. I know for a fact that we have fish, pork, steak, meat sauce, vegetables, and chicken sitting in suspended animation. There’s also a partial bottle of Absolute…I wonder if that’s included in EDF as well? The fixings for rest of this week’s menu are already in the house so we’ll start small now and go full steam ahead next week. 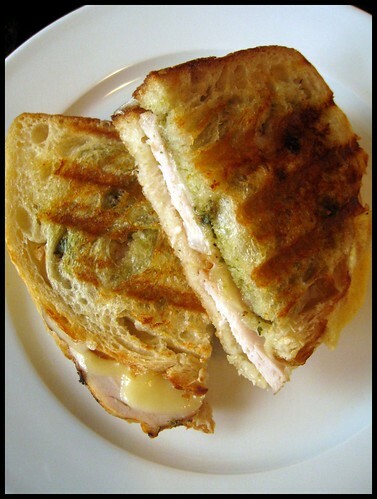 Step one of our EDF adventure took the form of Pork Pesto Panini. The bread came out of the freezer and the pork was the last bit of a roasted loin that the good folks at The Fresh Market fixed. We either had to eat it or toss it, and I hate to waste money by throwing food away. Instead of spending 45 minutes in the grocery store next weekend, I can finally figure out what is inside all those unlabeled, aluminum foil wrapped packs. This certainly could get very interesting. Thankfully, I won’t have rely on Wiki for ways to use whatever it is we happen to unearth in the freezer. Sandwiches are a great way to use up things you already have. Meats like pork loin, roast beef, or chicken can be sliced up and easily put between slices of bread. Get creative with condiments, like pesto, to take your sandwich from drab to fab. Heat a panini press to medium or a nonstick skillet over medium heat. Apply pesto to one slice of bread. Top with half of pork slices and a slice of swiss. Add remaining pork and top with second piece of bread. Lightly butter top slice of bread, flip the sandwich upside down, and place in your press or skillet. Lightly butter top slice of second piece of bread and close panini press. If using a skillet, carefully flip sandwich when the bottom is golden, brown, and toasty. Cook until both sides are well toasted, cheese has started to melt, and pork is warmed through. I soooo need to eat down my freezer. It’s pathetic, I tell ya. The reality is that we’re in about week 5 of this EDF adventure and the freezer STILL isn’t empty. And it’s not a big freezer. Where is all of this food coming from? I have been trying to do this for some time now, Both the freezer and the pantry are so well stocked,,, well lets say my cupborad runneth Over! Dinner will be whatever i pull out! kind of like a scavenger hunt! Santa brought the panini press, not realizing how tight our kitchen space really is. The foil wrapped brick is a great idea, and much easier to store. I need to pick one up myself to try a chicken under a brick recipe. I’m not looking forward to having to hack into the bird but I’ll try just about anything once. I also have a stepping stone from Home Depot. Use that sucker for a pizza stone since someone who lives in this apartment broke mine! Talk about your multi taskers! LOL! Oh dear. I rarely use my pizza stone but it lives on the bottom of the oven because it does a beautiful job of regulating the heat. And it is essential for making pita.